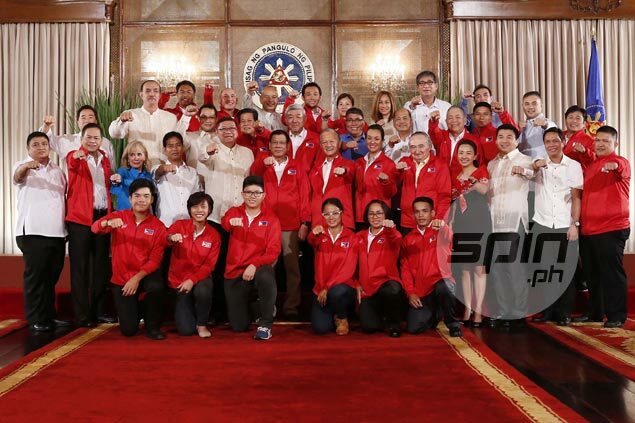 PRESIDENT Duterte lifted the spirit of Filipino athletes bound for the Rio De Janeiro Olympics with an elaborate sendoff at Malacanang Palace, bigger allowances and a promise of bigger incentives for medal winners. In a speech on Monday, Duterte wished all the athletes the best, even hinting that gold-medal winners in Rio will be given incentives bigger than the P10 million allotted by law for such an achievement. “I’ll give you an island,” said Duterte in jest. Six of the 12 athletes bound for Rio were present, namely weightlifters Hidilyn Diaz and Nestor Colonia, table tennis player Ian Lariba, golfer Miguel Tabuena, long-jumper Marestella Torres-Sunang, and taekwondo jin Kirstie Elaine Alora. The others are still abroad, in the final stages of their training before proceeding to Rio. Before the bulk of the athletes leave for Rio on Saturday, Duterte took time out from his busy schedule to give them a send-off at Malacanang, perhaps the first President to do so. While admitting that the task at hand in Olympics is daunting, Duterte lauded the athletes for the distinct honor of representing the Philippines in an event of such magnitude. As an added incentive, Duterte promised to increase the allowance of the Rio-bound athletes from US$1,000 to $3,000. Duterte also drew even more smiles when he granted photo opportunities with the athletes, even accommodating a few selfie requests from them. Duterte also turned over a Philippine flag to chief of mission and POC first vice president Joey Romasanta.